We sometimes partner with other businesses in order to generate donations for our rescue animals. Visit these other businesses below. You can also view our Partners Page for more information on supporting our partnered businesses. If you shop at Ralph's and have a rewards card? You can help us raise funds by linking your rewards card to 4Life Animal Rescue! A percentage of your purchase will go to helping pups in need. Click here for instructions on how to participate! ​​Use Wag! Dog Walking service to book a free walk, and Wag! will send us $25! 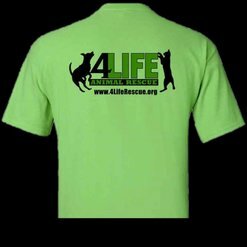 ​You can now place your orders for 4Life T-shirts and other gear and have them shipped directly to you! Proceeds from all purchases help support animals in need. Click here to purchase. Join iGive.com and any time you shop online at your favorite stores, iGive donates a portion of your purchase to us. iGive includes thousands of your favorite online stores, and helps us earn money at no extra cost to you. We are happy to announce that as a homeowner or renter, you do have options when it comes to insurance regardless of the breed of dog(s) you have. Please visit our partners at Einhorn Insurance Agency for help today! Einhorn Insurance will be happy to help you with home, condo, renter or liability insurance with a Pit Bull, Rottweiler, Doberman, Akita, Shepard…etc. We don’t breed discriminate and insure responsible owners of all dog breeds. Please mention 4Life Animal Rescue and for every policy you buy with Einhorn Insurance, they will donate $20. Contact Einhorn Insurance by phone 858-336-4644, email Agent@EinhornInsurance.com or visit www.EinhornInsurance.com. If you are interested in working with larger insurance companies, check out State Farm & Farmers Insurance, too! Policies and acceptance can vary, but there ARE options available! Ask around until you find a company willing to work with you.